Andy Niekamp, the Chief Adventure Officer of Outdoor Adventure Connection, has been leading adventure trips for decades, and has more than 25 years of back-country experience. He currently hikes more than a thousand miles a year. A native of Kettering, Ohio, Andy got his start as a Boy Scout and attained the ranking of Eagle Scout. After completing a successful career in information technology in 2010, Andy decided to pursue his passion and introduce others to backpacking and hiking. Today, Andy is the founder and organizer of Dayton Hikers, the largest outdoor recreation club in Dayton, Ohio. Andy Niekamp has hiked in more than 30 different states, from the east coast to the west coast. His backcountry specialty is the Midwest, Northeast and Southeast. Andy has over 14,000 miles of backpacking experience including more than 9,000 miles on the Appalachian Trail, a continuous footpath from Georgia to Maine that travels throughout 14 different states. His experience includes four end-to-end hikes of the entire trail (2,189 miles). Andy has been awarded four 2,000-miler certificates by the Appalachian Trail Conservancy (ATC). While more than 10,000 have completed the Appalachian Trail one time, fewer than 12 people have reported completing the Appalachian Trail four times. He is a lifetime member of the ATC. In 2019, Andy thru-hiked the 1,103 mile Florida National Scenic Trail. The Florida National Scenic Trail is a congressionally designated National Scenic Trail and is intended to offer a continuous, permanent non-motorized recreation opportunity for hiking and other compatible activities. Over its length, it showcases the incredible biodiversity, history, and rich culture of Florida. In February he received the Outstanding Citizen of the Year Award from the Ohio Parks and Recreation Association for his efforts in promoting hiking in Ohio. In 2018, Andy hiked the 210-mile John Muir Trail. The John Muir Trail is a long-distance trail in the Sierra Nevada mountain range of California, passing through Yosemite, Kings Canyon and Sequoia National Parks. The northern terminus is at Happy Isles in Yosemite Valley and the southern terminus located on the summit of Mount Whitney. For almost all of its length, situated within designated wilderness. In April, he received the Buckeye Trail Association Super Star Award for the second time. In May, Andy served as a trail maintenance crew supervisor for a group of 15 people from the American Hiking Society on a volunteer vacation at General Butler State Resort Park in Kentucky. In June, Andy became an Ohio Certified Volunteer Naturalist. In August and October he appeared on a local TV show called Nature's Corner to talk about The Buckeye Trail and Leave No Trace. In 2017, Andy hiked 540 miles from Georgia to Virginia on the Appalachian Trail to start his 5th end-to-end hike. He rode his bicycle from Cincinnati to Cleveland on the Ohio To Erie Trail and hiked the Art Loeb Trail in North Carolina. Andy served as the Volunteer Coordinator in May for the 2017 International Trails Symposium held in Dayton. He managed 140 volunteers in 230 volunteer slots working over a 1,000 volunteer hours in six days. 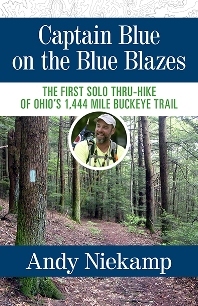 Andy served as a trail maintenance crew supervisor for a group of 8 people on a volunteer vacation at Carter Caves Resort Park in Kentucky In December he released his self-publish book titled Captain Blue on the Blue Blazes - The First Solo Thru-Hike of Ohio's 1,444 Mile Buckeye Trail. In 2016, Andy served as a trail maintenance crew supervisor for a group of 15 people from the American Hiking Society on a volunteer vacation at General Butler State Resort Park in Kentucky. The park's trails were devastated from the recent emerald ash borer infestation and the associated logging operations. 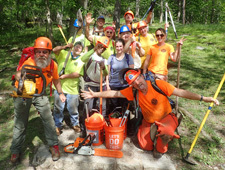 The crew repaired and restored all nine miles of trails in the park. View The Madison Courier Article. In 2016, Andy hiked the 115-mile Bartram Trail. The Bartram Trail connects the foothills of the Appalachian Mountains to the Appalachian Mountain chain. It begins in South Carolina, travels into Georgia and finishes on the Appalachian Trail on Cheoah Bald in North Carolina. The Bartram Trail follows the approximate route of 18th-century naturalist William Bartram's southern journey from March 1773 to January 1777. In 2016, A story about Andy's Buckeye Trail thru hike was chosen to be included in 2016 Official Ohio Travel Guide, the annual guide to discovering Ohio's multitude of tourism experiences. View The Guide Here. In 2015, Andy hiked the 270-mile Superior Hiking Trail. The Superior Hiking Trail is a footpath that follows the rocky ridgeline above Lake Superior on Minnesota's North Shore. It goes from the Canadian border south to bustling Duluth in wolf, bear and moose country through spectacular scenery of wild rivers, cascading waterfalls and beautiful vistas of the lake the Ojibwe called Gitche Gumee. In 2015, Andy hiked the 180-mile Ozark Highlands Trail. The Ozark Highlands Trail is in the heart of the Ozark Mountains in Arkansas. 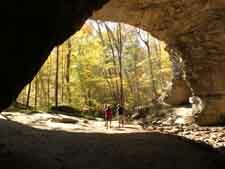 It stretches from Lake Fort Smith State Park, across the Ozark National Forest, to the Buffalo National River. Also in the spring of 2015 Andy became a Leave No Trace Master Educator. In 2015, Andy became a Leave No Trace Master Educator. In 2014 and 2015,, Andy was hired by Carter Caves State Resort Park in Kentucky as a Trail Crew Leader. Seven Americorps NCCC volunteers were assigned to the park for the month for trail maintenance activities. Under Andy's expert guidance, they completed many trail projects including building new trail, repairing damaged trail, building bridges, installing erosion control features and removing downed trees across the trail. In recognition of his trail work accomplishments Andy was awarded the "Willard Jillson" Award for appreciation of an individual who is motivated to strive beyond the ordinary. In 2014, The book Follow The Blue Blazes was published and included 25 beautiful color photos from Andy's epic Buckeye Trail thru hike. In 2014, Andy spent three weeks in Alaska hiking in various mountain ranges and coastal areas. He also hiked 390 miles on the Appalachian Trail working on his fourth end-to-end hike. In the fall of 2014, Andy completed his sixth end-to-end hike of the 76-mile Foothills Trail in South Carolina. In 2013, Andy thru hiked the 500-mile Colorado Trail. The Colorado Trail goes from Denver to Durango in the Rocky Mountains. The trail crosses eight mountain ranges, six wilderness areas and six national forests. It is Colorado's premier long distance trail. In 2013, Andy thru-hiked the Ohio To Erie Trail. The Ohio To Erie Trail is a 325-mile trail from Cincinnati to Cleveland and goes through the heart of Ohio. Andy is the first person to hike the entire length of the Ohio To Erie Trail. Read his trail journal. In 2012, Andy through-hiked Vermont's Long Trail, which is a 272-mile trail from Massachusetts to Canada. It follows the crest of the Green Mountains and is the most difficult long-distance trail, mile-for-mile. The Long Trail is over 100 years old and served as an inspiration to the creators of the Appalachian Trail. In 2012, Andy thru-hiked Kentucky's Sheltowee Trace. The Sheltowee Trace is a 308-mile trail, which wanders from Tennessee to the Ohio River through the Daniel Boone National Forest. In 2012, Andy thru-hiked Ohio's 1,440-mile Buckeye Trail (BT). The BT is the longest circular trail in the nation and is Ohio's official state trail. Less than 10 people have thru-hiked the BT, and his journey led him along state parks, canal towpaths, city bike paths, country roads, and urban crossroads. Read about his journey at www.buckeyetrailhiker.com. Andy has hiked the 76-mile Foothills Trail end-to-end seven times. The Foothills Trail cuts through the wilderness of Oconee State Park to Table Rock State Park in South Carolina. It also passes over Sassafrass Mountain, the highest point in South Carolina. It has a longer stretch of roadless trail than the Appalachian Trail and crosses by many scenic rivers, streams and waterfalls. 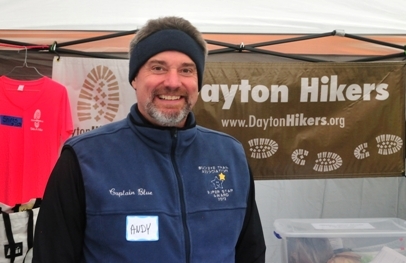 In 2012, Andy created and managed the first Buckeye TrailFest. Seeing an opportunity for change after his epic 2011 Buckeye Trail hike, Andy transformed the annual Buckeye Trail Association (BTA) meeting, a tradition of 50 years, into a state-wide trail festival. Forming a team of dedicated volunteers, Andy created a multi-day trail festival that appealed to all hikers in Ohio. The event attracted the largest turnout ever in BTA history and continues as an annual tradition today. At Outdoor Adventure Connection, your safety is important to us. We want you to acquire the skills you need, and we constantly learn from the experts so that we are prepared for any challenge. The Appalachian Trail Conservancy, Dayton Hikers, Buckeye Trail Association, Florida Trail Association, Sheltowee Trace Association, Colorado Trail Foundation, Green Mountain Club, Miami Erie Canal Corridor Association, National Speleological Society, Eastern States Speleological Society, Dayton Underground Grotto, Friends of Carter Caves and Rockcastle Karst Conservancy. When Andy is not out hiking, he can be found volunteering for the organizations below. Andy has received recognition for his volunteer efforts. In 2014 Andy became an official Kentucky Colonel authorized by the governor of Kentucky for his volunteer contribution to the Kentucky State Park system. The Kentucky Colonel is the highest title of honor bestowed by the state of Kentucky. In 2012 and 2018 Andy was given the Super Star Award by the Buckeye Trail Association for his outstanding efforts in promoting the Buckeye Trail, creating the Buckeye TrailFest and creating the Buckeye Trail Membership Drive. The Super Star award recognizes superior service over time but Andy received this award in just one year.